Two dozen students gathered near the College of Pharmacy buildings and marched to the tower Tuesday afternoon to protest against pharmacy professor Richard Morrisett, two weeks after a report found UT allowed him to remain on staff after pleading guilty to domestic abuse charges. The protest was hosted by the Revolutionary Student Front and was aimed as a “Rally to Run Off Morrisett,” according to the Facebook event and flyers posted on campus. The protest comes one week after the College of Pharmacy was found tagged with red spray-painted messages such as “UT harbors abusers” and “Watch your back Richard,” and two weeks after the Austin-American Statesman released a report about his domestic abuse charges. Jasmine Bell, a protester, said at the very least Morrisett should be fired because it seems as though UT is supporting abusers. Austin Smith, a protester, said it is hard to build trust with the University if they do not discipline actions such as Morrisett’s. “I heard about (the protest) and I try to stay involved in a lot of advocacy work, so supporting survivors of this type of violence or trying to prevent it through education (is important),” said Smith, a government and economics junior. “It’s been a really frustrating few weeks hearing that this man is being protected by the University, while simultaneously the University is trying to promote resources (to help survivors)." 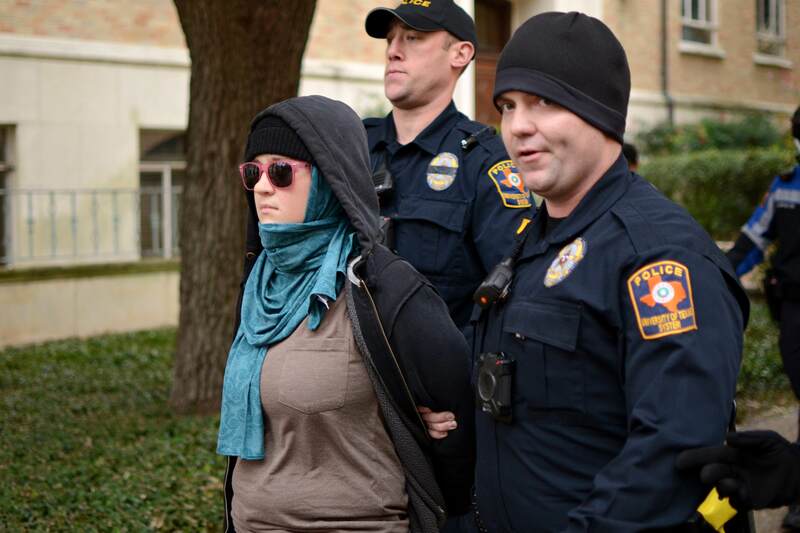 The UT Police Department remained near the protest and arrested one woman who was not affiliated with the University that had violated a previous trespassing warning, UTPD spokeswoman Cindy Posey said. Check out the video below to see the arrest. In May 2016, Morrisett was charged with strangling his girlfriend until "she saw stars." Morrisett was later accused of another violent incident in July 2016 that sent his girlfriend to the hospital and violated a restraining order, according to multiple arrest affidavits. Morrisett pleaded guilty to the first incident in February 2017, which resulted in an agreement with the Travis County District Attorney's Office that resolved his cases and sentenced Morrisett to four years of probation, 100 hours of community service and a required class on family violence. Protester Joshua Rosenthal said the University has not done enough following the incidents of Morrisett’s domestic abuse charges.